Caleb Ewan (Orica-GreenEdge) had a spectacular Tour Down Under, claiming the first and final stages of this years race, Orica-GreenEdge did even better with Simon Gerrans winning two stages as well, bringing their total to four out of six possible stages. Simon Gerrans also won the overall race and the points jersey so it really was quite a fabled race for the Australian team. Plus this year, every stage was won by an Australian, so it really was a home team Tour. This is the final painting of the first race of the ProTour season. I will switch to the classics and monuments over the next three months and then it will be back to some of the major and more minor stage races for the rest of the season. 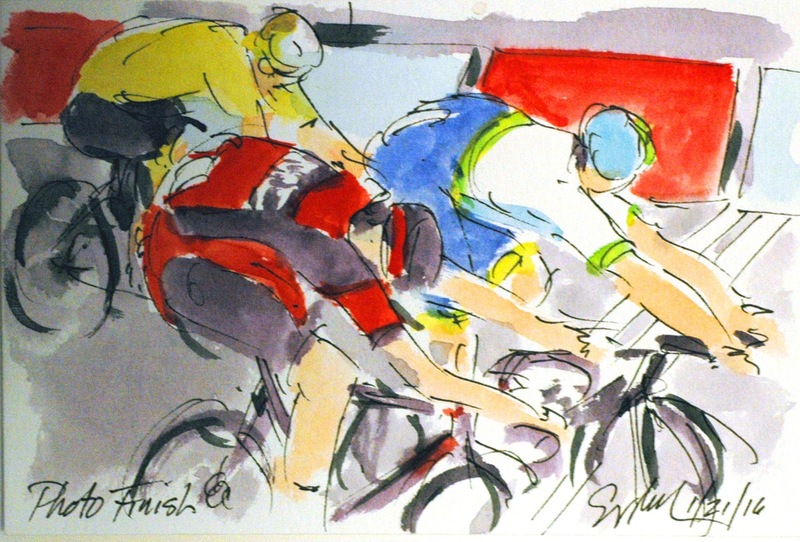 It is highly likely that I will be back painting the UCI Road World Championships live in Doha, Qatar. It is equally likely that I will be at the US Pro Challenge in Colorado and maybe even the US Road Championships in May. 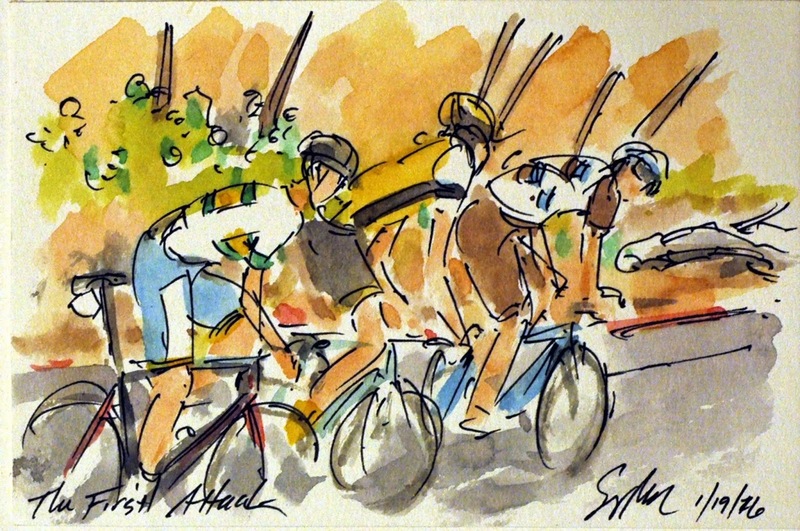 This is a small original watercolor and ink painting created using watercolors from www.richesonart.com and is available through my artist website at www.greigleach.com. To purchase this particular painting, just follow the direct link at the end of this post. 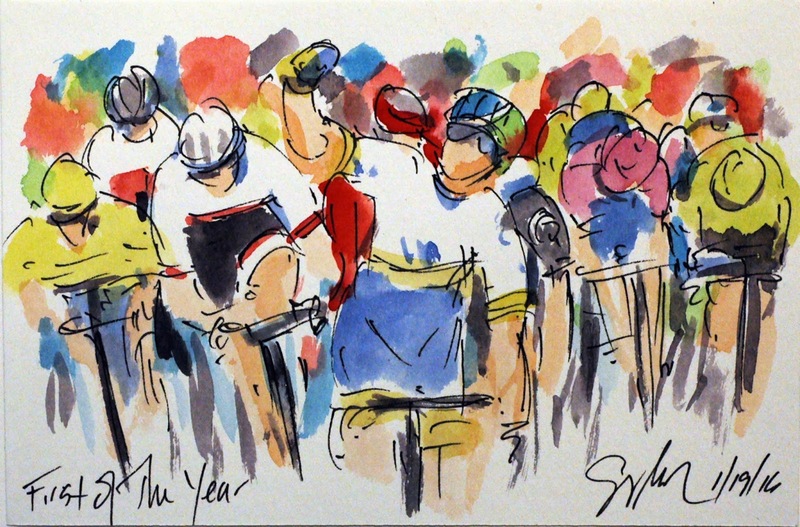 In addition, be sure to check out my new book, "Art of Cycling: Richmond 2015 UCI Road World Championships" available now at www.artofcycling.bike. With such a clean relatively flat, straight run to the line, the teams had time to get their lead out trains in order. Geraint Thomas (Team Sky) looks over to see Reinardt Janse Van Renburg with Tyler Farrar (Dimension Data) on his wheel. He may have been wondering just who were these two successful sprinters working for. 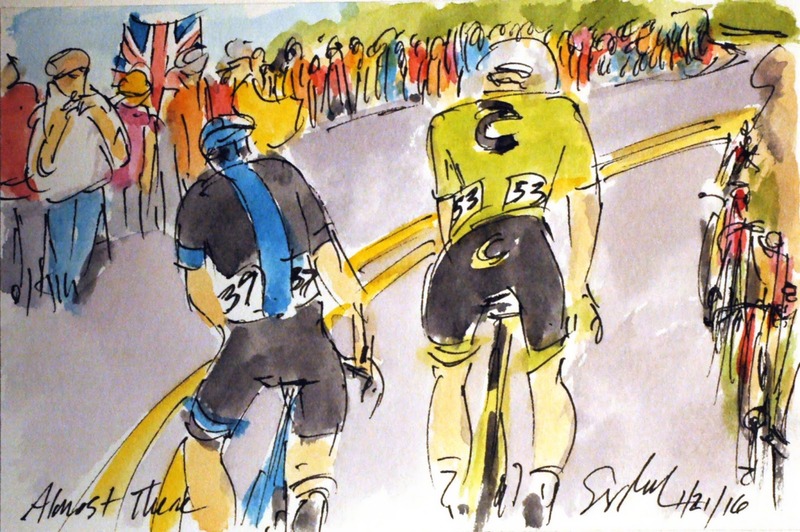 Thomas had Luke Rowe and his sprinter, Ben Swift on his wheel as the two teams hoped to put their man in the perfect position to win the sprint and the stage. Just peaking into the upper left corner is the train for Giant-Alpecin, a train that has had some very successful sprinters tucked onto the final wheel. 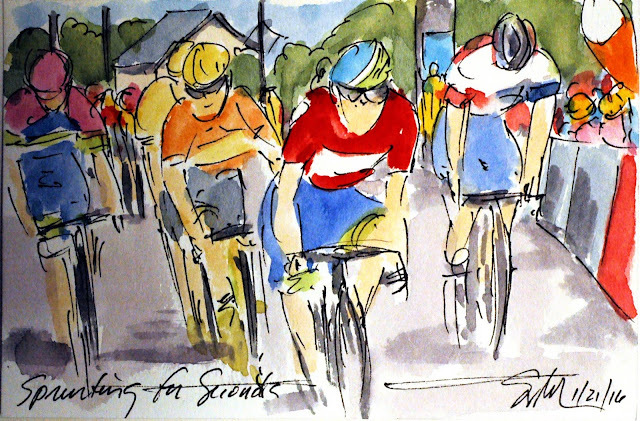 In the Feed Zone, the soigneurs will line up along side the road ready to pass bottles and musettes to their riders. 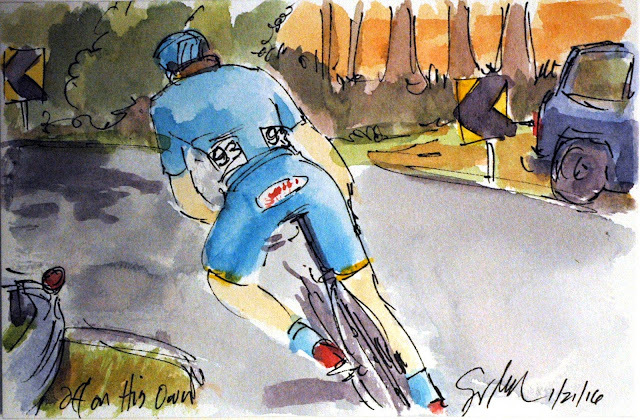 The problems arise when each soigneur in turn stands just a little bit further into the road so that he can be seen by the team, naturally this makes the road narrower and narrower. Finally, it is on the rider to get to the left side of the road to make the bottle pass safer. That didn't happen for this IAM Cycling support personnel. His rider forced him to make a dangerous pass and then jumped out of the way of the fast approaching riders from Drapac Professional Cycling and Astana. You can see by the soigneurs stance that he was already figuring out how quickly he could jump back to his left. Thanks to his awareness a rather nasty wreck was avoided. The peloton didn't let the first break go, maybe because George Bennett (LottoNL Jumbo) was only just over a minute off of the lead and Orica-GreenEdge wasn't going to take any chances with Simon Gerrans lead. Once the first group was caught, Maartin Tjallingii (LottoNL Jumbo) jumped away. 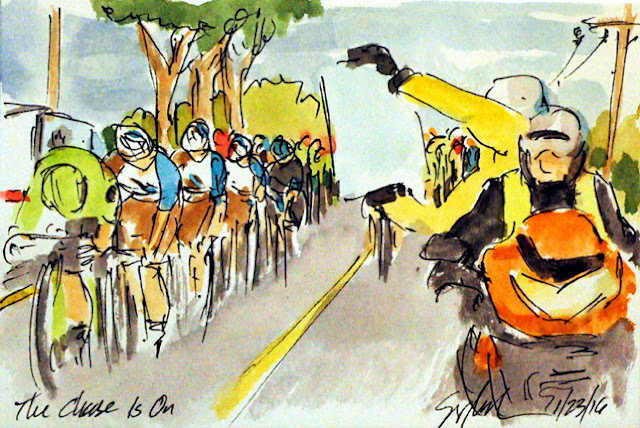 It seemed like as the peloton could only contain 6 yellow clad riders and once Bennett was in the group, Tjallingii popped out. The Dutchman looked back over his shoulder hoping that at least one more man would bridge up to him. 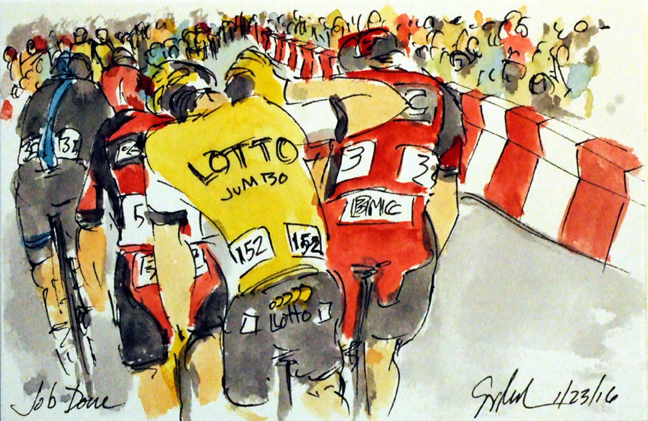 He had to be comforted that it was Thomas De Gendt (Lotto Soudal) that was the one leaving the Orica-GreenEdge lead peloton behind. From the firing of the starting pistol, the final stage of the Tour Down Under was on. Immediately Laurens De Vreese and Lieuwe Westra (Astana) jumped off the line at full speed. Since the stage was going to be a 20 lap circuit on the downtown streets of Adelaide, the organizers dispensed with the usual neutral start. As soon as pedals were spinning, it was time to race. The Astana duo was quickly joined by Adam Phelan riding for the wild card Australian team, Drapac Professional Cycling. Bridging across the going break were Carlos Verona (Etixx-Quickstep) and George Bennett (LottoNL Jumbo). Etixx-Quickstep has had a surprisingly quiet Tour, I feel like this is the first time I have seen their new kit, certainly the first time I have painted it. 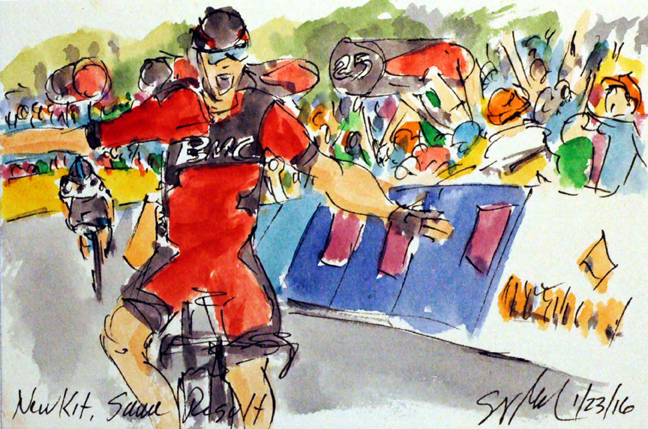 Three times Richie Porte (BMC) has raced up Willunga Hill (well actually considerably more than that) and three times in a row he has claimed victory at the summit. Although he is now riding for BMC Pro Cycling and the previous victories came while wearing the black and blue stripe kit of Team Sky, he still is the king of Willunga! It look like the main in polka dots riding for his former Sky team, Sergio Henao would get the better of him, but with one more steep ramp at about 800 meters to go, Porte was able to leave the Colombian climber behind (by six seconds!). Porte's ten second time bonus added to Simon Gerrans (Orica GreenEdge) coming in 18 seconds later still wasn't enough to claim the lead, but it was enough for second place just 9 seconds off of the lead. Sergio Henao (Team Sky) all put ensured that he would be King of the Mountain at the end this Tour Down Under, and he currently sits in third overall just 11 seconds off of the lead. Rohan Dennis was the first to attack on the final assault of Willunga Hill, unfortunately he quickly faded, After he went a rider from UniSa-Australia tried, but was quickly caught by George Bennett (LottoNL Jumbo). As those two faded from their efforts, Richie Porte (BMC) stomped on the pedals and rode everyone off of his wheel. 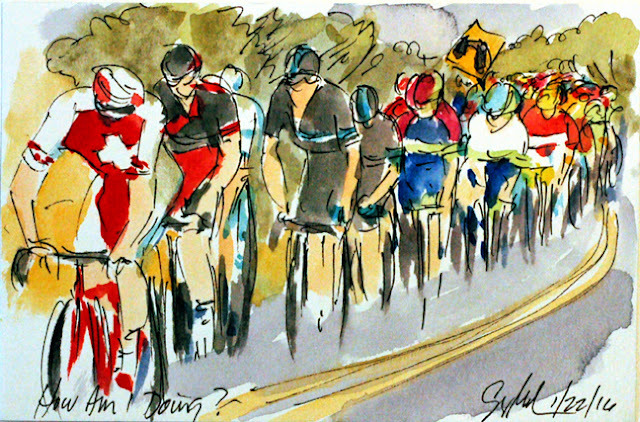 The only two who could even hope to catch the two time victor on Willunga Hill was the newly discovered Michael Woods (Cannondale) and the wearer of the Polka Dot Jersey of the King of the Mountains, Sergio Henao (Team Sky). Although at this point, he has yet to jump out of the swiftly shrinking peloton. 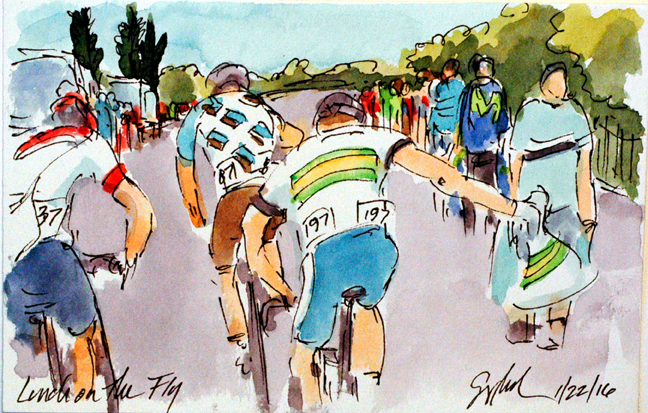 At this point you can see the Ochre Jersey of Simon Gerrans (Orica GreenEdge) as he struggles to keep sight of Porte and his overall lead. A team will have a designated leader, sometimes it may have two different objectives. or two possible race contenders. For BMC Pro Cycling, they have the luxury of riches, Rohan Dennis started the day in third overall, with their new recruit, Richie Porte not far behind. However, these guys and their positions on GC meant that the rest of the team had to work just that much harder. As the peloton road through Willunga Hill for the final time, those teammates would had spent themselves in support of their leaders, dropped to the back of the pack and prepared to fight another day. Maarten Tjallingii (LottoNL Jumbo0, Ian Stannard (Team Sky) dropped back along with the duo of Alessandro De Marchi (BMC) and Peter Velits (BMC) having done what they could for their teams. 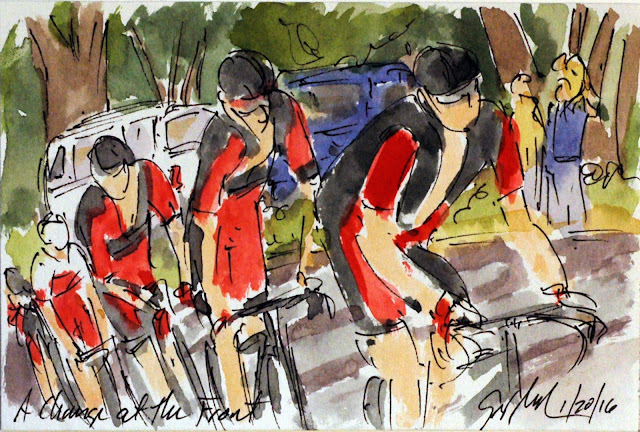 I just now noticed that I never painted in the black area on the small of the backs of the BMC kit. At the base of the first trip up Willunga Hill, the peloton caught up with (and quickly left behind) the early break away. With the peloton all back together, Team BMC decided it was now time to push the pace and make it as hard for the other teams as possible. 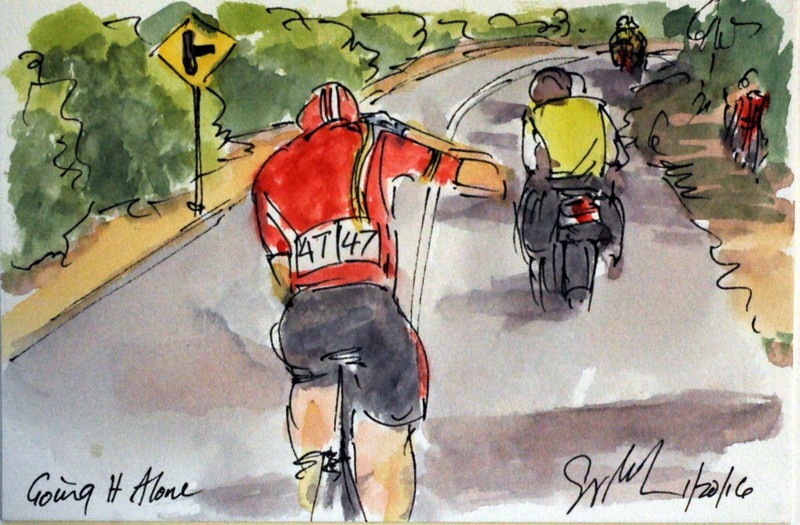 As they reached the top of the climb, it was Danilo Wyss on the front follow by his teammates Rohan Dennis, Alessandro De Marchi and Richie Porte. 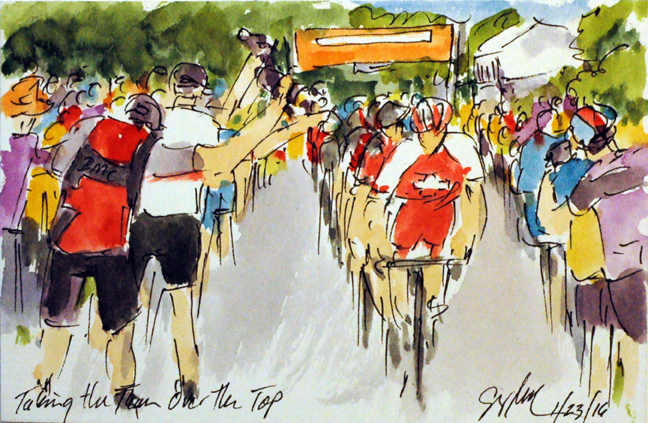 Porte is quite familiar with the climb, he has won the last two times the Tour Down Under has make this climb. I am sure he and the team were planning on making it three in a row. With six minutes to make up on the break and only 50 kilometer left to the end of the stage, it was going to be a long hard chase. 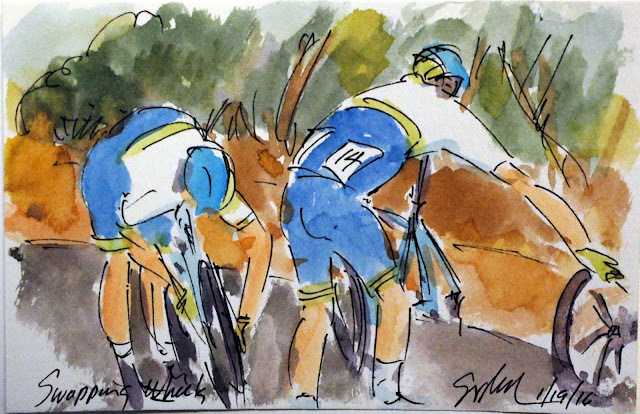 Orica-GreenEdge, had decided to leave it to the other teams to do the work. None of those up the road posed a serious threat to Simon Gerrans' overall lead, however currently all of those up the road were the virtual leaders of the Tour Down Under. 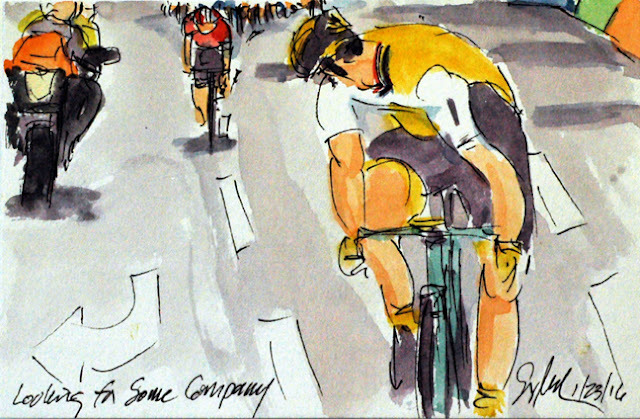 The rider for Cannondale was putting to much effort to look at the time keepers wipe board, but those behind, riding for Ag2r La Mondiale, could look and see if they were making any progress on catching those up the road. The penultimate stage of the Tour Down Under takes in quite a variety of the South Australian landscape. As I am writing this it is snowing heavily here in Richmond, VA, so this view of the shimmering waters of the South Australian sea is quite the treat. For the escape group, they had little time to take in the scenery as they continued to work together to build up to an over six minute lead on the apparently disinterested peloton. 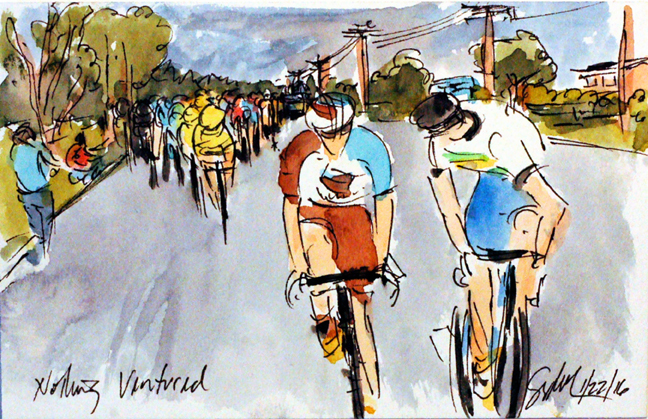 Or the peloton was just waiting for the effort of two climbs of Willunga Hill, the summit of the final climb marks the finish line of the stage. It almost looks as though the foursome of Lars Boom (Astana), Nelson Oliverira (Movistar), Reinhardt Janse Van Rensburg (Team Dimension Data), and Pim Ligthart (Lotto Soudal) were intentionally looking away from the inviting coast. As soon as the peloton hit the end of the neutral start, Lars Boom (Astana) jumped out of the pack on a very long bid for victory. He was quickly joined by Nelson Oliverira (Movistar) and Pim Ligthart (Lotto Soudal). Once the trio had established a bit of a gap, several others tried to bridge across, thinking this might be the day that the break would succeed. The only one to get onto the trios wheels was Reinhardt Janse Van Rensburg of the new pro tour team, Team Dimension Data. 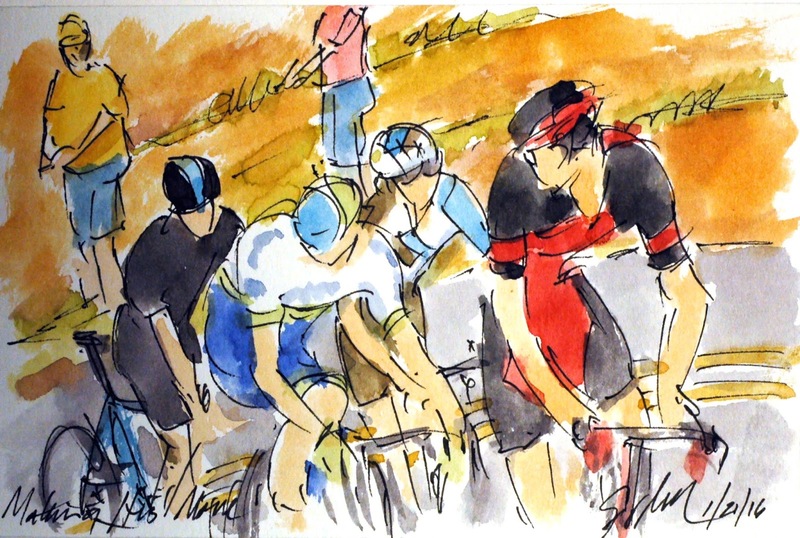 This was a strong, experience break, perhaps they would be the ones to break the strangle hold of the peloton this year. 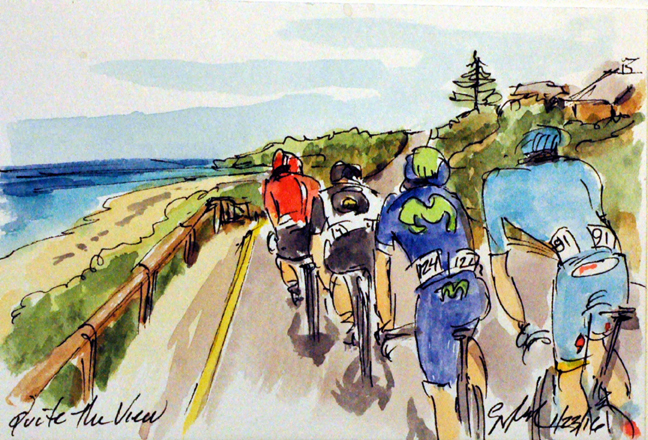 The big debate as the riders road up the climb out of Port Elliot was whether or not the sprinters would be able to contest for the win in Port Victor. They were there, but didn't have the legs to stop Simon Gerrans (Orica GreenEdge) from claiming his second victory in a row in the Tour Down Under. 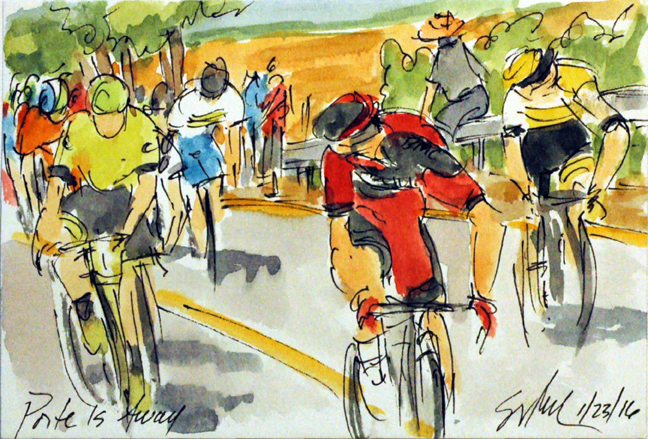 Just behind the man in the Ochre Jersey of race leader was Ben Swift (Team Sky) and Giacomo Nizzolo (Trek-Segafredo), both sprinters. Just missing out of collecting bonus seconds was Jay McCarthy (Tinkoff) who held second overall but lost time to the victorious Gerrans. 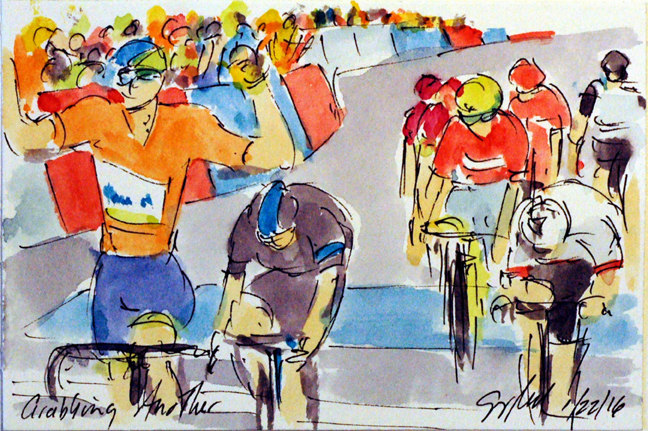 It is begining to look like Gerrans will claim yet another overall victory in his home tour. Only Willunga Hill and the final stage stand in his way. With all of the contenders all together over the top of the final ascent of the day, Jesus Herrada (Movistar) caught everyone napping as he launched an aggressive attack. You can see Ian Stannard (Team Sky) looking over at his teammate, Geraint Thomas, asking if they should go after the former Spanish National Champion. Tour Down Under: How Am I Doing? Danilo Wyss (BMC) who is wearing the National Champion's Jersey of Switzerland, peeks back over his shoulder to see just how much damage he is doing on the climb up out of Port Elliot. Tucked onto his wheel is his new teammate, Richie Porte, followed by the rest of the diminishing peloton. Nothing ventured, nothing gained, as the old saying goes. 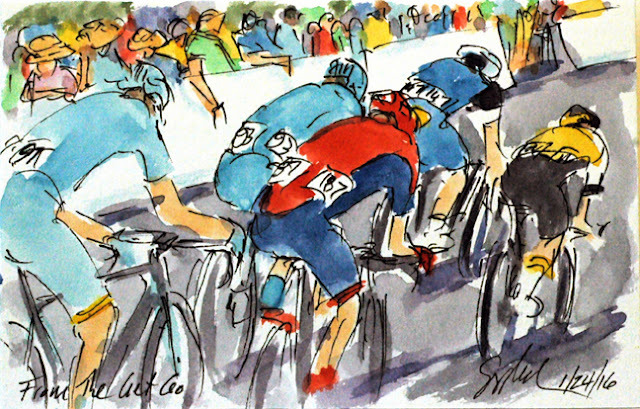 Sadly for the trio of escapees (David Tanner - IAM Cycling has already returned to the peloton), it was going to be nothing gained for Alexis Gougeard (AG2R) and Patrick Shaw (UniSA-Australia). They must have been curious why the Tinkoff lead peloton had bothered to chase them in, but competitors must compete. Alexis Gougeard (AG2R) checks in with the neutral service vehicle to find out just how quickly the chasing peloton is closing in. At one point he. along with David Tanner (IAM Cycling) and Patrick Shaw (UniSA-Australia) had built up just over four minutes on the disinterested peloton. 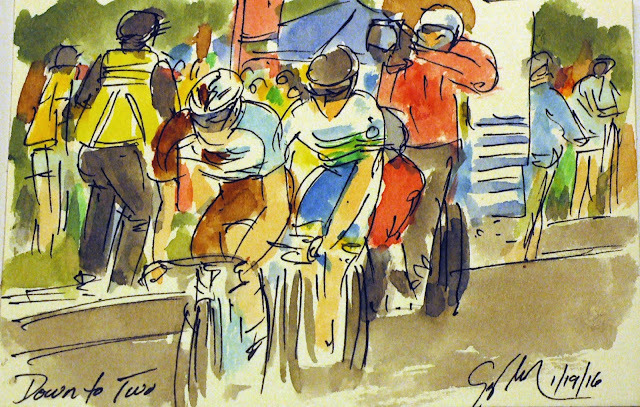 At least the trio hoped they were disinterested, it isn't like any of them were anywhere near the leaders on the General Classification. Naturally, the early break away (although this one didn't get away until after the first intermediate sprint) was the first to reach the feed zone. The race organization will designate an area slightly over half way through the stage were the soigneurs can pass musettes of food and drink to their team riders. The racers will consume over 2,000 calories while racing the relatively short 140ish kilometer stages of the Tour Down Under. One of the dreaded mis-calculations is the bonk, when I rider doesn't take in enough food and figuratively runs out of gas at the end of the stage, just when he needs it the most. 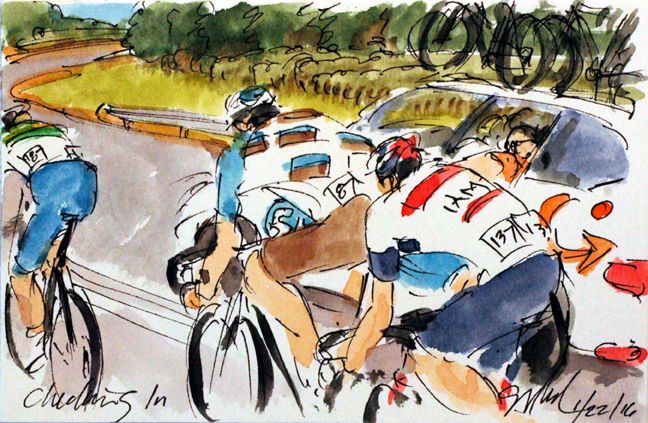 Here, Patrick Shaw (UniSA-Australia) has just grabbed his lunch, while David Tanner (IAM Cycling) and Alexis Gougeard (AG2R) already have theirs. Yes, you have seen Gougeard's name already, he was out in the first breakaway in the first stage of this year's Tour Down Under. With experience comes skill. Simon Gerrans (Orica GreenEdge) and Rohan Dennis (BMC) were able to catch the escapees on the descent. A descent that reached speads in excess of 105 kilometers per hour. The duo fought all of the way to the line. So close was their finish that it had to go to the photo finished where it was learned that it was Gerrnas who came from behind to beat last year's winner at the line. 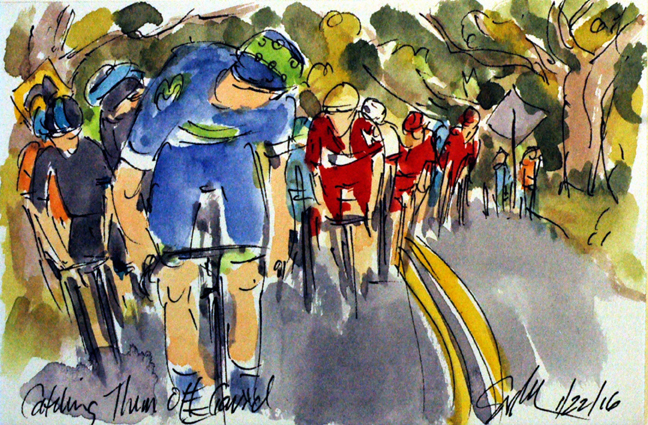 With Gerrans win and the bonus seconds, he will be taking the Ochre Jersey back for the home team. It was a surprise to all that the trio of Rohan Dennis (BMC), Richie Porte (BMC) and Simon Gerrans (Orica-GreenEdge) had been dropped by this duo. 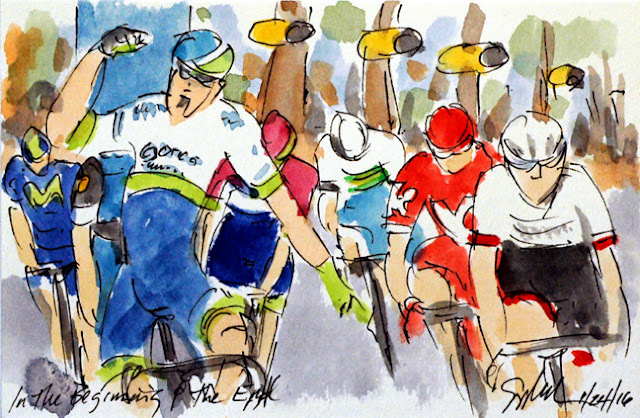 Sergio Henao (Team Sky) was a known climber but the Canadian Michael Woods (Cannondale) surprised them all. The two raced to the summit just around the corner. The maximum points in the King of the Mountains competition was claimed by Henao, but the pair now had the chance to storm down the other side of the climb all of the way to the finish line and the stage victory. With the short steep ascent of Corkscrew hill to form the launch pad, it was Richie Porte in his new BMC kit who was the first to jump out of the diminished peloton. Quick to jump on to the Tasmanian's wheel were Simon Gerrans (Orica-GreenEdge), Domenico Pozzovivo (AG2R La Mondiale) and Serio Henao (Team Sky). 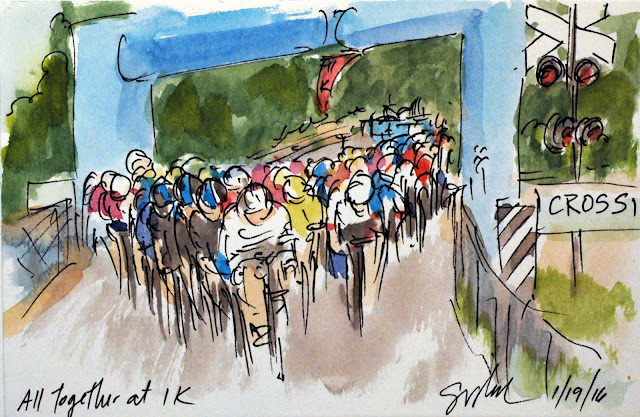 The parched hillside was dotted with cycling fans although most had gone to the top to see who would claim the hill and most likely the stage. With Laurens De Vreese (Astana) up the road, there were only a couple of bonus seconds up for grabs at the intermediate sprint out on course. Last year the race was decided by only two seconds, so any chance to grab a few seconds are well worth the effort. The winner of stage 1, Caleb Ewan (UniSA-Australia) claimed the best of the rest slot, 2 seconds and some valuable points in the sprinters jersey competition (the red jersey he is currently wearing). Race leader, Jay McCarthy (Tinkoff) bedecked in Ochre nabbed third and a single second. While being attentive Diego Ulissi (Lampre-Merida) could only manage a fourth place at the line, so he was unable to add any bonus seconds to his second place overall. The Tour Down Under seems to be the race of the lone break away, so far two out of three stages have featured a solo effort. Only the first stage had a three man break. To go solo is a tall order, but Laurens De Vreese (Astana) had the faith that he could beat the odds. With Vreese out front the rest of the Astana team was able to sit in in the peloton saving their energy for a possible ploy on the final climb of the day. The teams holding first and second place took the responsibility of setting the tempo and riding to chase down the sole break away rider up the road. Manuele Boaro (Tinkoff) let the peloton bedecked in the polka dot jersey of the King of the Mountains. He was joined by a teammate and then the lion share of Lampre-Merida, the former riding for Jay McCarthy and the latter for Diego Ulissi. I apologize that I didn't managed to get this group of paintings as well as I should have. Once Peter Kennaugh (Team Sky) had jumped it was up to the others to chase the British Champion down. The first to set off in pursuit were Jay McCarthy (Tinkoff) and Rohan Dennis (BMC). 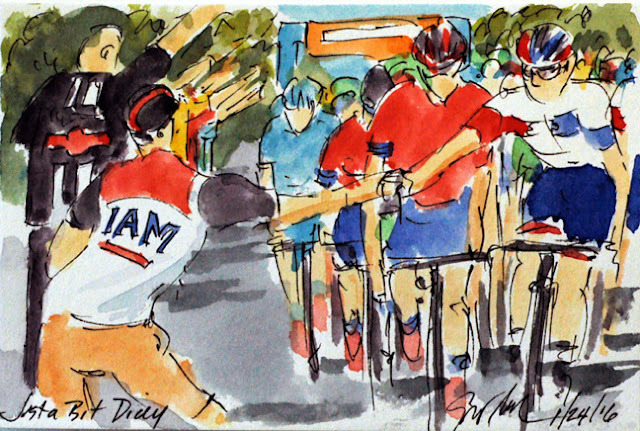 Diego Ulissi (Lampre-Merida) left it just a little to late, almost catching the fading McCarthy at the line. With McCarthy's win, he claimed the Ochre Jersey of overall leader, with Ulissi and Rohan following the winner of the stage on the line and in the GC. Unfortunately for Orica-GreenEdge, Daryl Impey tangle handlebars with an Astana rider and went down taking out Simon Gerrans and a number of others in the peloton. All were given the same finishing time, but it was the bonus seconds that established the new General Classification order. 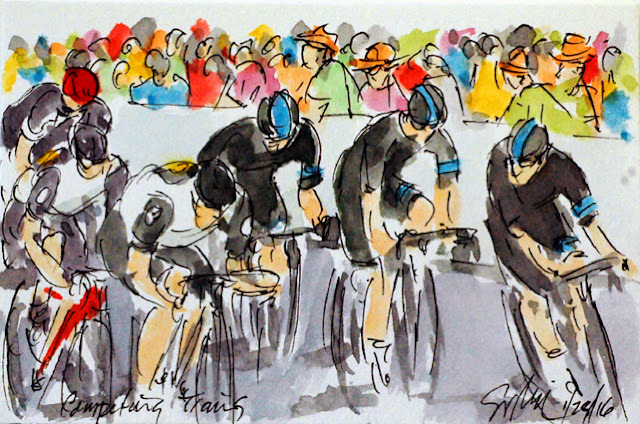 For the second day in a row, Team Sky hid out in the peloton until the final kilometers in the race. As the peloton started the final 8 kilometer climb up to the finishing line in Sterling, Ian Stannard lead his teammates, Luke Rowe, Geraint Thomas and Peter Kennaugh as the Sky boys raised the pace just as BMC had done on the previous lap. The question is, are they setting up Thomas for the GC or Kennaugh for the stage. Hint, it was Kennaugh who was the first to start the sprint for the line. Spoiler alert, he didn't get there first. With the penultimate climb of the day the team of last year's over all victor, Rohan Dennis (BMC) came to the front to lift the pace and shuck some of the contenders. BMC had yet to put their noses in the wind, but must have felt like today was the day to set up Dennis or perhaps their new rider, Richie Porte. Porte took second last year, just two seconds behind his new teammate, Dennis. Orica-GreenEdge has been expected to do the work on the front, first by being a ProTour team from Australia, and secondly, because the Ochre Jersey is on one of their team members. So it is that Luke Durbridge, Michael Hepburn and Michael Albasini were called upon to ride tempo and keep the lone break away rider in check. With the repetitive uncategorized climb on the finishing circuit, it was unlikely that their sprinter, Caleb Ewan, would be able to keep is leader's jersey, but the team leader, Simon Gerrans, had already picked up 5 bonus seconds in the earlier intermediate sprints. He must be setting the stage to go for the General Classification lead by the end of the day. Stage 2 of the Tour Down Under feature a bit more climbing than the opening stage with the only KOM climb coming right out of the gate (again). The climb proved too much for the sprinter, Rafael Valls Ferri (Lotto Soudal) as he was the first to withdrawal from the race. His teammate, Adam Hansen, went off on his own in a solo effort to claim a stage for the Belgium team (Hansen is an Australian, however). The Aussie held off the peloton for almost 80 kilometers before being reeled back in on the final circuit. For my regular readers, you will know that I love a title with more than one meaning. Here is another. First of the Year refers to both Caleb Ewan's (Orica-GreenEdge) first win of 2016, but it also refers to the first ProTour stage win of the season and the first win for Orica-GreenEdge. Nothing like getting the first victory out of the way, not that it makes a sprinter any less hungry on the next day out. With this victory it follows the Ewan is the first overall leader of the Santos Tour Down Under and will be spraying the press photographers with champagne shortly. Despite all of his efforts from the very start of the stage, Sean Lake (UniSA-Australia) was caught with less than 6 kilometers left to race. The young Australian had been out front of the peloton for over 120 kilometers just to be swallowed up a few minutes from the finish of the day. All was not in vain, he will be pulling on the King of the Mountains Jersey on the podium tonight. 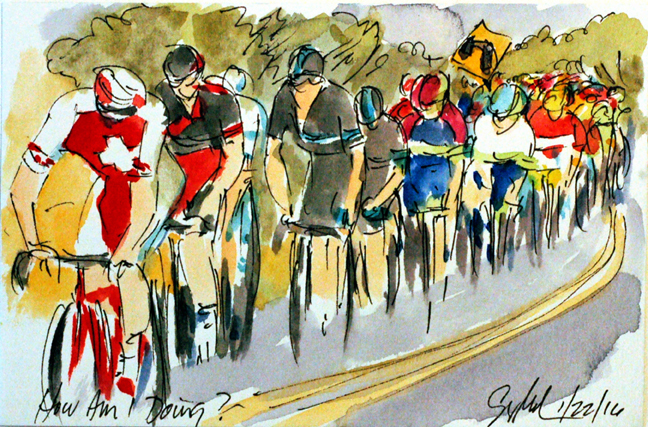 All day Team Sky was hidden from view, until the peloton closed in on the final kilometer of the stage. 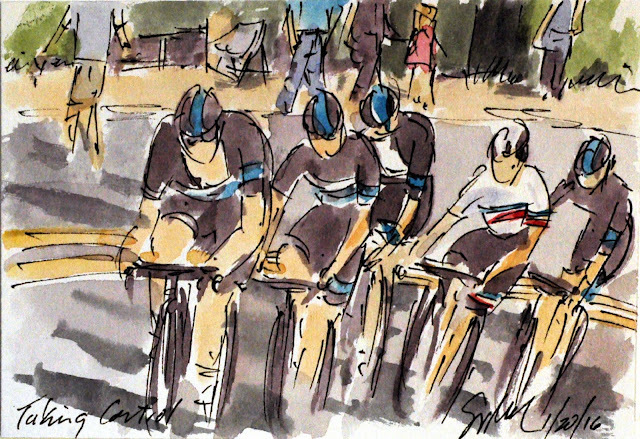 It was then that Peter Kennaugh (Team Sky) hit the front driving the pace for his sprinter. Fortunately everyone got safely across the railroad crossing and were able to sprint it out for the stage win and the leader's ochre jersey. As a team rider, one has to be ready to aid your protected rider at all times. Here Mathew Hayman (Orica-GreenEdge) stops to give his man, Simon Gerrans, his back wheel in order to keep Gerrans in contention for the overall. With the wheel, Gerrans saved the time it would have taken for his team car to get up to him with the replacement for his punctured rear tire. Hayman then waited for the his mechanic and rode in with the follow caravan leaving Gerrans able to finish with the same time as the winner of the stage. With the peloton just 45 seconds behind the break away, Martijn Keizer (LottoNL-Jumbo) sat up having seen the hand writing on the wall. However, Alexis Gougeard (AG2R) had already claimed both intermediate sprints gaining 6 bonus seconds, whereas Sean Lake had already claimed the first leader's jersey of the Santos Tour Down Under, the King of the Mountains jersey for getting over the first climb of the season first. By virtue of being off of the front, the pair were getting some great TV time from the TV Moto on their back wheel. With the heat beating down on the peloton, it was important to keep drinking. 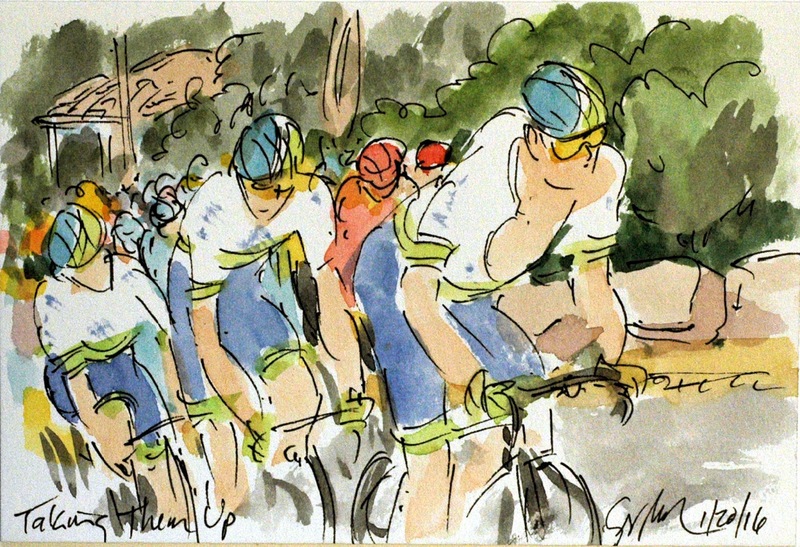 Michael Hepburn (Orica-GreenEdge) and his teammate, Luke Durbridge rode tempo on the front of the peloton, The duo pegged the break away at two minutes, holding them there until the last kilometers of the stage. 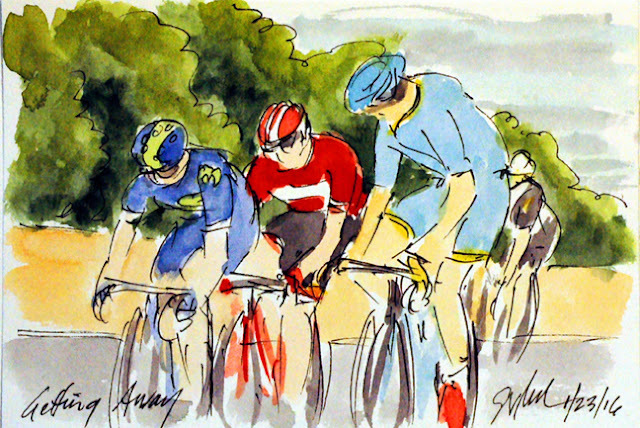 With the three men up the road, it was less likely that someone with fresh legs would jump out of the pack and spoil the sprinters' day. Santos Tour Down Under is the opening of the Pro Tour season taking advantage of the January summer heat in the southern hemisphere. 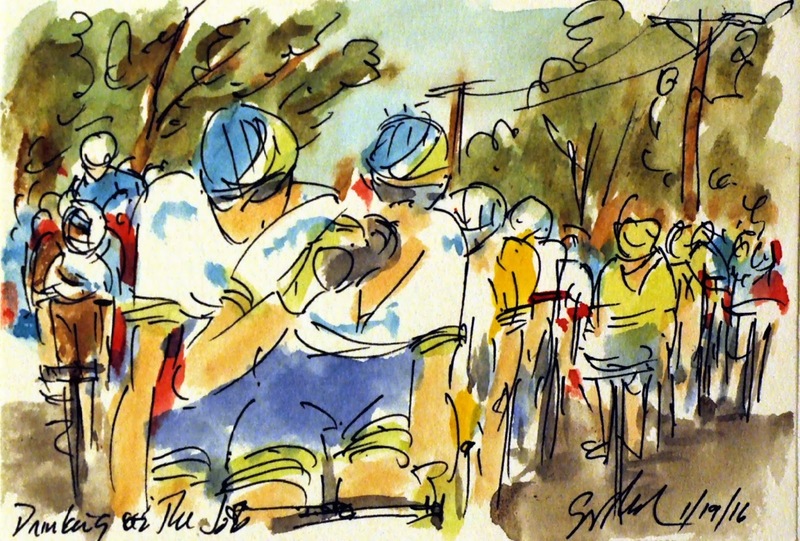 The first stage was marked by very hot temperatures along with strong gusts that plagued the peloton for over 130 kilometers. The only climb of the day came at just 12 kilometers into the stage. The early break were off the front, therefore the first mountain jersey was up for grabs between Alexis Gougeard (AG2R), Martijn Keizer (LottoNL-Jumbo) and Sean Lake (Team UniSA-Australia). Lake got the jump on his two break compatriots, Keizer gave chase but didn't quite have the legs to catch the fading Aussie. 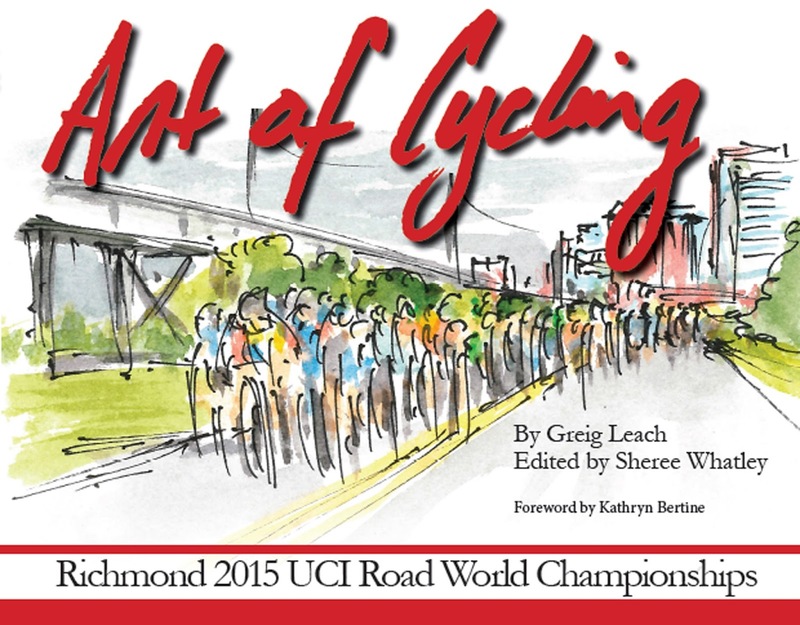 My new book, "Art of Cycling: Richmond 2015 UCI Road World Championships" pre-selling now! It is almost ready! My book of all of my paintings and writings on the Richmond 2015 UCI Road World Championships is at the printers. 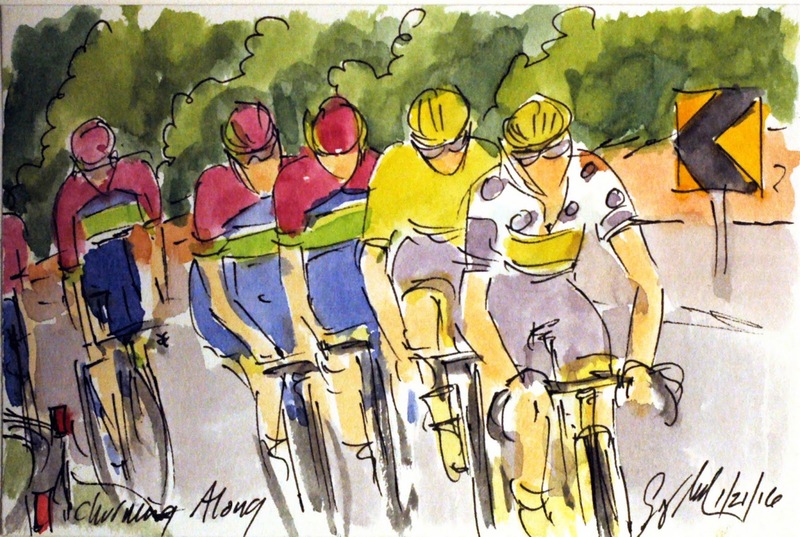 Pre-orders are being taken now at a $5 savings off of the cover price at www.artofcycling.blogspot.bike The 160 page full color hard bound book contains all of the paintings I create live during the races as they were contested on the streets of my adoptive home town of Richmond, Virginia. 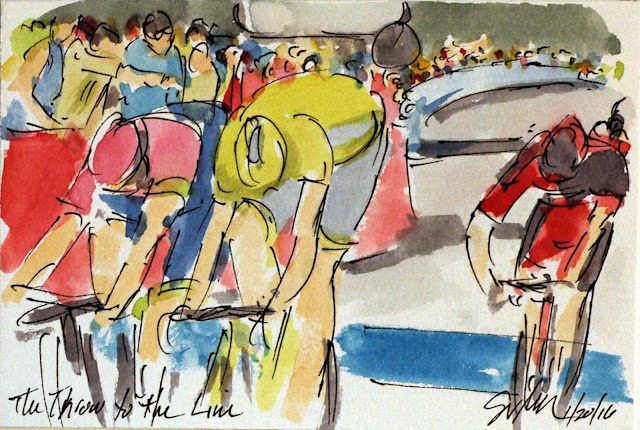 I worked from the race feed creating the works in real time as the races were happening. The text for the book is based on my daily posts in this blog, but edited for accuracy, spelling and the difference between blog grammar and writing for the printed page.